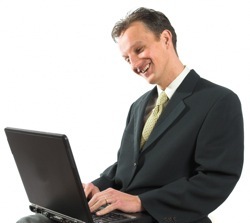 “Welcome to the course Online Responsibility,” a too-perfect male voice intones while you stare at a stock photo of a man who’s grinning idiotically at a computer. You lunge for the Next button, but you’re not allowed to click it until the droning man finishes, which he finally does while you’re in another browser tab, watching a video of a cat playing the piano. I’ve seen a ton of elearning, and the painful majority of it starts this way. What are some alternatives? 1. Use a meaningful course name and skip the explanation. If the title of the course is “Data Privacy,” then you can trust learners to understand that it concerns keeping data private. A meaningful title frees you from having to ponderously explain what the course is about. 3. Immediately show concise, appealing objectives. Briefly tell the learner what they’ll be able to do as a result of the course, and focus on what they care about. Here’s a sample makeover of some boring objectives. 4. Motivate by showing, not telling. Normally, your objectives should be motivating enough. If you think your learners need even more motivation, avoid the temptation to present statistics or to otherwise tell them why the topic is important. Show them through a story. For example, you could (quickly!) show a young couple with a baby being turned down for a mortgage because one of our employees accidentally released their private data, which a bad guy used to get credit cards and destroy their credit history. For more on using stories to motivate, see Made to Stick. 5. Put basic information in activities, not a presentation, and let people prove that they already know it. If you want to make sure everyone has the same basic knowledge before continuing, design activities that let people either prove they know the basics or discover the basics through feedback. This starts the material with an activity, rather than a presentation, and I suspect it makes the definition more clear than a text blurb would have. It also lets people who already know the definition skip ahead by skipping the detailed feedback once they’ve confirmed that they made the right choice. What do you think? What techniques have you seen or used that get learners immediately, actively involved in a course? Let us know in the comments. Please join me and Norman Lamont in London on June 6 for the fun, hands-on workshop “Training design for business results.” It’s action mapping on steroids. You’ll get in-depth practice applying activity-centered design to one of your projects. Learn more about the workshop. Love it! Same thing I have been telling my clients for years- ditch the narration and the boring intros! I like to employ the 4 C’s- conversation (like social), challenge (like gaming), competition (teams), and of course context (as close to real life as possible). Thanks for the info & research about narration. I am a hired editor for a big publisher where narration is standard. I standard turn the audio off, because the voice and the slowness bugs me. I think a lot of learners do the same. I’m working on a course now where I’m considering opening it up with humorous scenarios that leads into the content of the course. I’d like to really draw learners in with a quick video. Thanks for sharing this list. It’s great to keep in mind! Our parent company makes us sit through eLearns with all the ‘avoids’ that you mention above. Even if we turn off the narration, you have to wait for the voice to end. Grrr!!! I think there is a place for narration, and I think the use of narration you describe above is absolutely correct. When building eLearns and using narration, I also have key words appear on screen to reinforce the narration. I would never build a powerpoint with all the words and then talk to it (though of course, we’ve all expereinced death by powerpoint from people who do this). And stories help us engage with the content! Great posting as always. Agree with all comments, Cathy! Your straightforward way of explaining concepts, simplifying learning for our audience is so helpful. I’m evangelizing the rest of the IDs on my team of your action-mapping, scenario-based, showing not telling way to designing learning. So, for the current Fire Safety course I’m designing for our 27K employees, instead of “Understand the basics of fire control” and ” Practive fire safety”, we’re using: “Put out a fire”. You are spot on Cathy. One thing I’d like to add though would be that explanation (point 1) usually is needed, but outside the course itself. An explanation like this can be included with the agenda, objectives, etc. in the invitation or course summary to get people interested and understand the course. It really boils down to the SME in most cases, every word is sacred to them and must be heard or seen on the screen by the learner. As the late great Rodney Dangerfield said IDs need to “get respect” for your wonderful ideas to happen more often. Oh the narrator. Until recently I had small scale clients where I could really start from a blank slate and they let me do my thing and trusted my recommendations (no narrator). Now I’m involved in some big projects that start with official “request for proposal” documents. To my horror these include in detail all the must haves for the course (one or two narrators, boring course name and objectives, quiz in the end – which should use as many different question types as possible (and then they list multiple choice, single choice, drag-and-drop…)). So far I didn’t dare to slaughter their holy-narrator-cow already in the proposal. Does anyone have experience with situations like this? When is a good moment to suggest going without a narrator? Great post Cathy! Re: “Nix the Narrator”, I totally concur that a boring narrator can completely mind-numbing, but I also freel that simply “reading text” on screen can be pretty dulll. I think there should be a balance between text and voice. But, here’s the caveat… I believe organizations should STOP using boring, professional voice overs and instead opt for an internal employee with a great voice, who fully understands the context and speaks in “real-world” language. What if narration in elearning became more “conversation and casual” like we people speak at a local starbucks. What if the narrator integrated humour and actually changed vocal inflections from time to time? Wouldn’t that then be something to listen to? I think pure text does not lend itself to engaged and inspired learning. When I see a bunch of text on the screen, I just want to hit the “next” button:-). I agree that if we use narrators, “real” people can be much more effective, especially if they’re someone that learners know, or they’re a subject matter expert who speaks clearly and naturally. This means that the activities or (minimal) presentations that really benefit from audio get audio, and the more in-depth stuff can be read at the learners’ pace, skimmed, copied & pasted, or whatever, like any normal web page. This puts more of the pacing under learners’ control, and because it’s just HTML, people who like big text can enlarge it easily, people with screen readers can have it read to them at the pace they choose, people on smartphones can read it without side-scrolling, etc. etc. Great post Cathy! Really informative and helpful. Excellent advice Cathy. Too often we want to be clever, or flashy, in our production of courses, and that means titles that aren’t clear and an emphasis on too much telling and narration early on. This piece is a great antidote and reminder of what people actually come to the course for: to learn. Fast. I can totally relate here with the spoon fed content. I see this a lot in e-courses as well where a narrator just talks to slide as they read off main points off them. I’d like to integrate these steps to make the training I creating right now effective for those who purchase it. Will have to think about how to incorporate more showing. Great article! Thank you for the information. I will definitely keep these tips in mind when creating my next online course. Thanks! We try and keep our voice overs as natural as possible – talking to someone sitting next to you, but we’re fully aware that nothing is going to please everyone. I don’t like blanket statements that indicate there is one way of doing anything. While I agree that narration can be boring, we have to remember that there are multiple learning styles. Plus, there are many different types of learning; some that don’t really lend themselves to elearning. Balance is the key to success in many things. For example, I am a highly verbal learner and can learn as well from good narration when it provides good explanations. I despise games. I have seen games abused and destroy all credibility in what could have been a valuable course. Don’t forget some learners have visual difficulties or are blind!! Blind users of the internet use screen readers such as JAWS, which read text on the screen out loud. In testing done by an elearning developer that I know, they found that visually impaired people using JAWS set the reading speed at a much quicker pace than a human narrator would use, so a slow, “professional” narrator would likely be annoying to them as well. If you wonder whether your elearning tool works with these readers and how to include ALT tags and similar codes to help make sense of the screen, you might search for JAWS and the name of your tool. Thanks for this question and reply as I was thinking the same thing as it relates to 508 compliance, which we must adhere to for all courses. •	Marcella is so correct – SMEs think every word is sacred. As if each person taking the course has perfect recall for everything they’ve read. Is it so difficulty to convince engineers and other technical types that people need to learn key concepts, not everything. I’ve found that at times – with patience and guidance I can get the SME to realize less is more. However, that’s not always the case. And, for many – using fewer words is a huge culture shock. •	As Sandra N. noted, large clients have some horrific requirements. Unfortunately, these come down from on high and it’s virtually impossible to convince anyone to do otherwise. I understand a client may want to ensure standardization, especially on a huge project, but the requirements should be realistic and conducive to creative and engaging eLearning. •	Craig’s idea of using an employee with a great voice is especially true when the subject is highly technical. There is something to be said for speaking with understanding and not just reading from a script. Of course the other benefit is proper pronunciation of technical terms you might have forgotten to specify for the voice over person. The only problem I can see with this suggestion is that many of my SMEs are too busy to record audio. I’m sure that’s the push back I’d get. I also appreciated the links supporting the points made. Of course I kept following links and had to drag myself back to finish my comment. Very useful and informative post! Totally agree. Only having a meaningful course name reduces around 50% of the confusion. Think wise before come up with a name. I am using Adobe Captivate to design and deliver an elearning program on ethics. I have incorporated a few very short presentations by various experts into the program — none are longer than 1.5 to 2 minutes. Here is the question. As the learner moves from a screen containing text to a screen containing the video, should I set the video screen so that the embedded video auto launches/plays or should I set it so the learner can control the video launch/play (or skip it altogether). What’s your thinking on it? Thanks! I use Adobe Captivate for the online courses I have created. I utilize a variety of media to enhance the message and design my own backgrounds using Photoshop. I use piano music quietly playing in the background across all slides in the module to stimulate cognitive functioning focusing on concentration and retention. Color schemes are carefully chosen based upon the topic being covered. After a required welcome slide, I present them with expectations for the course, topics to be covered and start them off with a video recorded scenario that I directed involving employees in the company integrated into the presentation. I develop the course into topic-based modules that usually do not exceed a length of 2-3 minutes. Each module has a video scenario, I do use voice-over on the slides that contain talking bubbles with text that gradually appear at selected points on each slide allowing them the option to mute the audio as a personal preference, also an activity such as solving a puzzle based upon questions, fill in the blank, etc. At the end of each module there are review questions with feedback that they must complete that prepare them for the graded quiz at the end of all modules. Great points in the article, even though I don’t totally agree with your opinion regarding narration. If the narrator keeps a steady pace accompanied with light music playing in the background, this could make it a little less painful throughout the course. I absolutely loved your insight on this topic! I made an immediate connection with this post because I am currently taking an IDT graduate course, and everything you mentioned aligned with the topics we are discussing, cognitive information processing theories. The idea that new information should be presented to a learner (especially adult learners) that is meaningful and concise has a huge impact on whether or not they will retain it, let alone store it in their LTM. Creating associations to new information with things or ideals that they are already accustomed to is also beneficial in my opinion. It was also reassuring to see that you value the use of visually teaching as an approach. I guess I hadn’t realized how much of a debate there was as it relates to the verbal system of knowledge and the imaginal system. So again I thank you for your insight, and I will keep it in mind for future learning/teaching experiences. I really enjoyed reading your post. I am an ID student and find these 5 quick tips to be very helpful. We have discussed in class about presenting the information to engage the learner and also the idea of level setting which relates exactly to your #5 tip of putting basic information in an activity, not a presentation. I have seen courses that use this type of activity and how much more interesting they become. I see now how this type of activity you described covers two concepts, level setting the knowledge base of your learner and keeping them engaged. This is a good tip I will take with me on my journey to becoming an ID. Thank you!